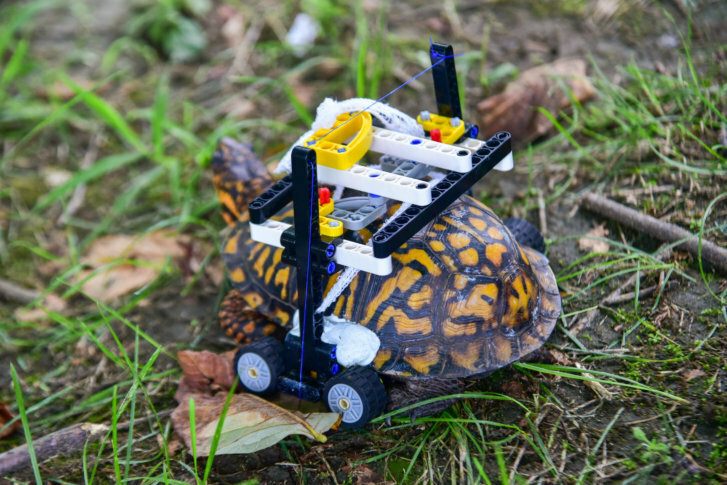 WASHINGTON — A wild Eastern box turtle at The Maryland Zoo is rolling along just fine and healing from an injury to its shell thanks to the help of custom-made wheelchair made from LEGOs. The turtle was found in Druid Hill Park with multiple fractures to the bottom part of his shell in July, said Dr. Ellen Bronson, senior director of animal health, conservation and research at the zoo. Veterinarians performed a surgery on the turtle and added metal bone plates, sewing clasps and surgical wire to help keep the shell fragments together, according to the zoo. A few weeks after surgery, the grapefruit-sized, approximately 18-year-old turtle had his own LEGO wheelchair, which gets him off the ground and allows his legs to move. “We are very happy that he is recovering well from his injuries and we plan to return him to the wild once he is fully healed,” Bronson said.